When a herd of rampaging wild elephants strays into their land, the villagers around India’s Mudumalai Tiger Reserve don’t panic. They call a gentle mahout. In his slight frame, wearing a simple vest and a lungi sarong, Mr. M. Maran, an unassuming man in his mid-fifties, doesn’t look particularly heroic. But seeing him in action, even an audacious stuntman is sure to be amazed. Maran rides Mudumalai, a majestic tusker named after the reserve. 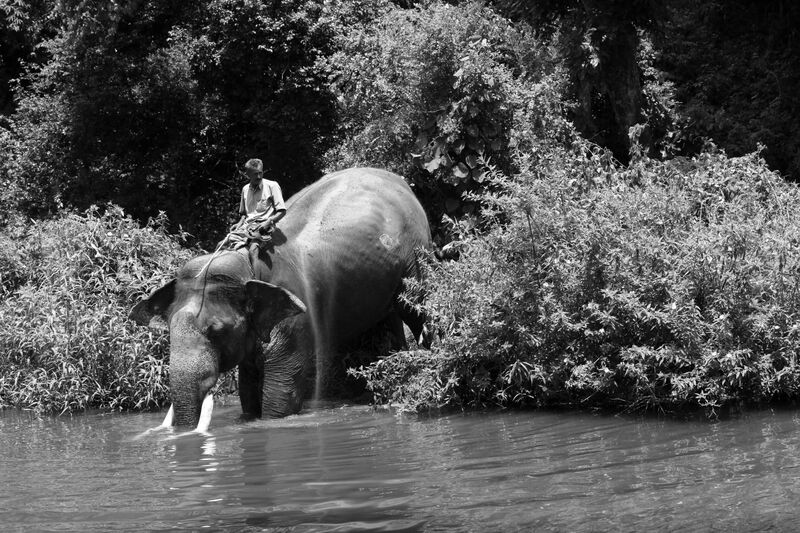 His job is to chase encroaching wild elephants that stray into a village back into the forest. His elephant is a kunki, an animal specially trained to deal with such situations. Like a policeman on patrol, Maran is always on standby, waiting for any news of trouble. Maran and Mudumalai have been involved in many heart-stopping chases through dangerous forest terrain, sometimes late at night. “We’ve often had to flee with a wild herd at our heels,” he says. “I hang on to Mudumalai knowing that if I fall, ¬the herd will trample me and tear me to shreds.” Despite the danger, Maran says he loves his job and wouldn’t trade it for anything in the world. They are both locals: Mudumalai was caught in the park in 1967 and Maran, a Jain Kattunaikar tribal, was born in the park in 1953. For Maran, the elephant is an avatar of the Hindu Lord Ganesh; every time before mounting Mudumalai, Maran touches its feet and says a short prayer. Their relationship is a deeply affectionate one, a special bond between human and animal. They have been together for the last thirty-two years, citizens of the forest, trusting each other with their lives. Their days start early, usually at 5:30 in the morning, when Maran takes Mudumalai to the river for a leisurely bath that could last from an hour and a half to three hours. At 9:00 a.m., he feeds the animal a generous portion of rice, coconuts and salt. They are free for the rest of the day, unless, of course, they get a distress call from a village. On some days, Maran takes the elephant for another dip in the river in the afternoon. Maran has seen many tigers since then and he isn’t fazed now. “I worry about tigers when I am on foot. I am more frightened of wild elephants as they sometimes charge you unprovoked. The tiger attacks only if severely provoked,” he says. Once Maran was attacked was by a gaur (Indian bison) while he was walking in the forest looking for his elephant. He was badly hurt and had to rest for a few months before he recovered fully. “I was very bored and missed my elephant and my life in the forest,” he says. These days, he is a lot more careful when he goes into the forest on foot and is usually armed with a sickle. Maran has five sons, and like his father, he takes his children on elephant back and shows them tigers in the wild. He knows that at least one of them is sure to follow in his footsteps and keep up the family tradition. The villagers around Mudumalai can rest assured that whenever there are wild elephants on the rampage, there’ll always be someone charging to the rescue.